The Manifold Valley, which runs almost parallel with Dovedale, has been described as the 'Switzerland of Staffordshire' and offers some of the most spectacular scenery in the Peak District National Park. The River Manifold rises at Flash Head just south of Buxton near Axe Edge Moor, it runs for 12 miles (19 km) before joining the River Dove. For part of its course, it runs underground from Wetton Mill to Ilam, where it re-emerges from boil holes in Ilam Park. The name Manifold may derive from the Anglo-Saxon 'manig-fald' meaning many folds, referring to its meanders. 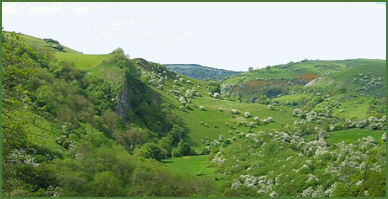 The valley is more open than neighbouring Dovedale with grassland and woodland along the banks of the river, which is occasionally interrupted by the spectacular outcrops and crags. The mix of woodlands, grasslands and limestone crags of the Manifold Valley combine to provide a very rich variety of habitats for wildlife. The valley has a number of caves, the most famous of which is Thor's Cave. Beeston Tor (OS grid reference SK105540) is a prominent rock face opposite the confluence of the River Hamps, which is popular with rock climbers. The Beeston Tor Cave (otherwise known as St. Bertram's Cave) at the right-hand side of the crag is an important archaeological site and has been visited on and off from the late upper palaeolithic age. The Beeston Hoard was discovered in the cave in 1924, which included a number of elaborate Anglo-Saxon brooches and coins. The coins date the hoard's deposition to around 875 and possibly associate its concealment with the Viking army's over-wintering at nearby Repton in 873/4. Wetton Mill, in the characterful small village of Wetton at the top of the valley was once used for for grinding corn, and the remains of a mill stream, along with a grindstone, may still be viewed today. The mill is long since disused, but the Tea Room remains popular with tourists. The small, isolated village of Butterton-in-the-Peak overlooks the valley. The name is of Anglo-Saxon origin and derives from ‘butere’, meaning butter, and ‘dun’ meaning hill. The village is built of local sandstone. At the centre of Butterton is a small ford where the Hoo Brook runs across the cobbled village street. On the opposite side of the valley lies the characterful village of Grindon. The ruins of Throwley Old Hall, a large medieval manor house and once the seat of the influential Meverall family, was first recorded as a residence in 1203 when Oliver de Meverell settled here, the Meverell family remained in ownership of the hall until the mid seventeenth century. The house passed to Charles Cotton on his marriage to the widow of the last of the Meverells. In medieval times a village stood on the site, but it may have been abandoned before the Hall was built. It is now in the care of English Heritage. The Manifold Way footpath and cycle way runs for 8 miles (13 km) from Hulme End in the north, where there is a visitors centre within the old station building to Waterhouses in the south, mostly through the Manifold Valley and the valley of its tributary, the River Hamps, following the route of the former Leek and Manifold Valley Light Railway. Thor's Cave, also known as Thor's House Cavern and Thyrsis's Cave, is situated in a steep limestone crag, the large impressive cave entrance measures 7.5 metres wide and is 10 metres high. 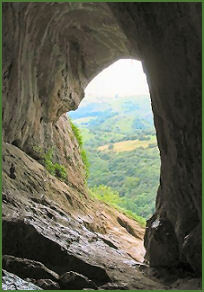 The cave, which is situated 360 feet above the River Manifold, is clearly visible from the valley bottom and dominates the central section of the valley. It may easily be reached via a stepped path from the Manifold Way, from the entrance there are stunning views into the valley. The roof of the cave is supported by massive limestone columns deep in the interior. Excavations carried out by Samuel Carrington in 1864–1865 and further excavations from 1927 to 1935 found human and animal remains, (including those of a now extinct species of bear) stone tools, pottery, amber beads, and bronze items within Thor's Cave and the adjacent Thor's Fissure Cavern. Some of these items are now on display in the Buxton Museum. The caves are estimated to have contained the burial sites of at least seven individuals. 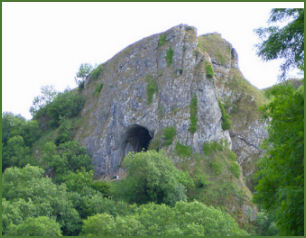 The finds suggest the cavern was occupied from the end of the Palaeolithic period, making it one of the oldest sites of human habitation in the Peak District. There was more more intensive use during the Iron Age. The youngest findings dated from the Roman and Saxon eras. The cave scenes in Ken Russel's film adaptation of Bram Stoker's The Lair of the White Worm were filmed in Thors Cave.